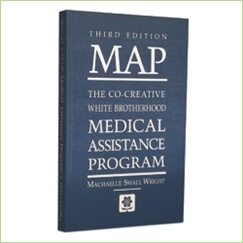 MAP: The Co-Creative White Brotherhood Medical Assistance Program - Perelandra Ltd. This book and the program it introduces is the result of seven years of research and work at Perelandra by Machaelle Wright with nature and the White Brotherhood. MAP (Medical Assistance Program) is easy to use for anyone who feels that his or her present medical support is not enough. Why a third edition? Refinement: Including ETS for Humans simplifies the process steps, Emergency MAP, Professional MAP and surrogating MAP for children. The steps for combining the Calibration Process and MAP are refined and clarified. The kinesiology instructions are expanded and improved. And Machaelle has updated how she presents the information and makes it easier to refer to your MAP book when you have a question. The second edition of MAP is also available in Spanish. A friend gave me MAP as a present in 1990 and I have never looked back. What an amazing tool! Over the years I continue to learn how to work better with my MAP team by how I give them information about what I'm experiencing. Recently after watching the MAP workshop DVD I set up a regular schedule with my MAP team to work twice a week on a complex health issue. This has been very effective. I will never forget the time my MAP team moved me through a bad flu overnight so that I could handle important work commitments the next day. The session was an unusual one and very effective! My husband used MAP when he apparently had kidney stones and was in tremendous pain. It was astonishing to us both how effectively MAP moved him through two "crises" a couple weeks apart. He didn't have to go to the hospital at all and hasn't had problems since. I have been using MAP for almost 3 years now. From the first I intuitively felt it was right for me (and loved the feeling of having someone to turn to if I ever had a medical emergency--I would never be truly alone!). I struggled quite a bit with feeling like I wasn't doing it right and went through many sessions where I talked through my doubts. I kept on having sessions and have gotten to a point now where I trust that my MAP team and I are truly working together. MAP is an integral part of my life. Especially now, when I cannot afford to go to therapy, it has been an invaluable source of emotional support. I know I can take my messiest, most complicated emotional and mental concerns into a session and my team will help me work through them. I have felt deep releases occurring during my sessions and it feels so good to know I am not alone with what I go through. I open a MAP coning for every chiropractic visit. The MAP team is able to help the chiropractor on the subtle levels. Since I rest after the session, the MAP team tells me when I can sit up, and when it is better to sit up to rest rather than lie down. Very helpful! I've been using the MAP program for close to 20 years. I use it if I get sick or hurt or stressed, and preventively, to re-align smaller problems. My health is now better than it was when I was young, and MAP is a large part of the reason why. My MAP team gives me chiropractic-type adjustments. When I injured my fascia (connective tissue) my MAP team worked gently to release it from spasm. When I can't sleep, a MAP session will usually do the trick. I wrestled with curing a sinus infection, without success. When I finally did a MAP session, it cleared right up. I have a Professional MAP team, in my work of energy healing and communicating with spirit guides. The quality of my work improved noticeably when I started doing it within MAP conings. MAP is required for all my healing students. on 3/27/2011 Prepare to co-create a whole new level of well-being!! This book is an excellent tool for those wishing to penetrate the depths of what it means to heal - in every sense of the word. It is also PRACTICAL. Follow the book's instructions and prepare to be surprised, relieved, comforted, inspired, integrated, AND - to save yourself lots of money and time. (I've used MAP process on myself, pets*, and at work as a physical therapist. I've also used in in conjunction with various medical appointments/procedures. It is an invaluable asset in many ways!) Enjoy! * Note from Perelandra: MAP isn't for animals. Mary is referring to the Nature Healing Process for Companion Animals explained in the MAP book and Perelandra Paper.